The Exception to the Rule or the Exception That Proves the Rule? Supported and funded by a joint grant from the Mellon and Volkswagen Foundations, as well as a grant from the Wenner Gren Foundation. Further support comes from the German Archaeological Institute. 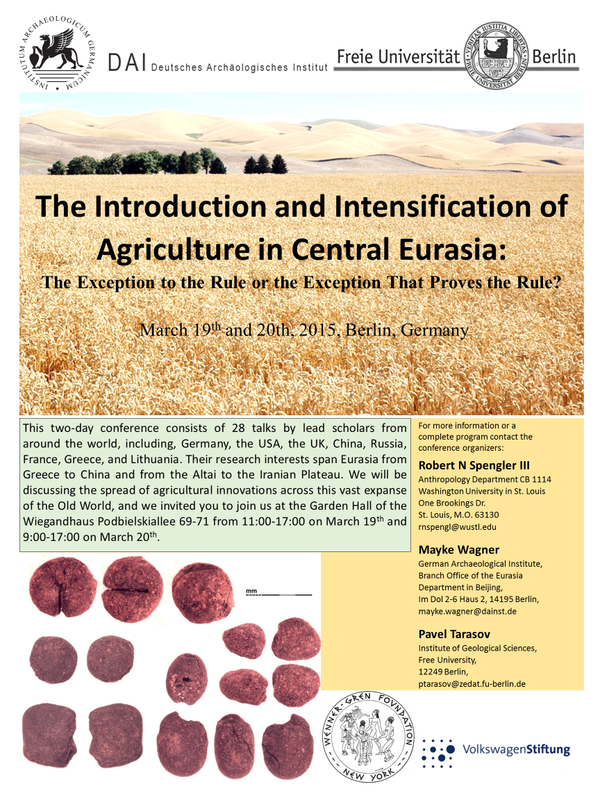 The theme of this workshop, agricultural introduction and intensification in Central Eurasia, was interpreted in a broad sense to include related topics of increasing social complexity and exchange. Inner Asia is an anomaly in discourse surrounding social complexity; the early Iron Age is marked by a demographic transition, long believed to be fueled by increased pastoralism. In the rest of the world, agriculture is accepted as a cornerstone to the development of social hierarchy and population growth. One of the least studied parts of the world, in terms of agricultural origins and spread, is also the region that breaks down the classical model of social development – the exception to the rule. This conference pooled an international group of scholars to discuss the growing realm of paleoeconomic data coming out of Central Eurasia; in many cases these novel data do not fit the long-held models of economy in the region and demand that a new approach be taken. We have taken steps toward the construction of a new economic model for the Bronze and Iron Ages of Eurasia, and in doing so reshaped the general understanding of social developments and cultural complexity across the Old World. The Middle Holocene Changes Seen in Archaeological and Environmental Archives from Central Eurasia: Coincidence or causality? How Did Wheat Come to China? Some examples of agriculture and trade or exchange of agricultural products from the 2nd mill. BC to the Roman Period in Central Eurasia.